STGCON 2019 will take place August 2nd through the 4th! WE HAVE MOVED FOR 2019! PLEASE CHECK OUR LOCATION PAGE FOR MORE INFO! Online registration will be available through July 31st. Make sure you get your tickets by then, prices will go up at the door. We look forward to seeing you for another fantastic convention! 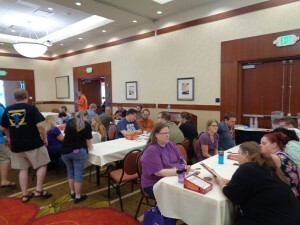 STGCON is THE board game convention held in St. George, Utah. We will offer lots of open space for playing board games as well as tournaments and learn-to-play events. For a full weekend of 24-hour board gaming, as well as the many other scenic opportunities available in the local area, you will be sure to enjoy STGCON. What is a “Board Game Convention”? Monopoly, LIFE, Yahtzee, Scrabble, Sorry and many other games are some titles we all grew up with. In the past 20 years, board games have evolved to include more strategy, and quite a bit more variety. Some of these include Ticket to Ride, Catan, Agricola, and Small World. Whatever you like, there is sure to be a game that fits your interest. We have all sat around the kitchen table to play a game at one point or another. A board game convention is the same idea, but on a much larger scale. 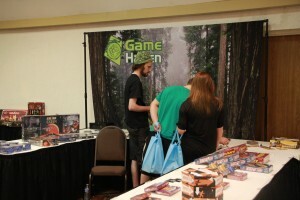 Typically games are set up on multiple tables throughout a large space, such as a conference room. There are hundreds of board games, card games, classic games, and other styles of games to pick from. These games are available through the game library, or by playing with other attendees. Many people travel from around the region to attend, and meeting new people and learning new games makes for a fantastically fun weekend getaway. In addition to all the games available to play, there are vendors and demonstrations throughout the event. Game designers will use events like this to “test play” new games as well, giving us all a sneak peek at something we might see on the shelves in stores in the future. Vendors like to show us all the latest and greatest, as well as reminding us of the favorite items still available. Want even more info? Check out our STGCON 2017 Program Guide Guide and 2016 STGCON Program Guide.